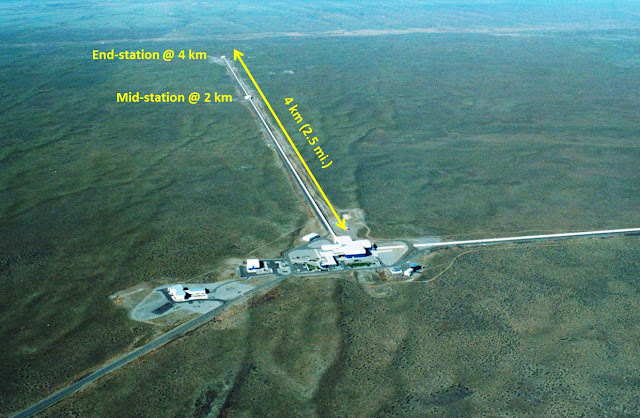 Above: The gigantic LIGO gravitational wave detector, seen from the air. …. But it’s not sound. What we’re detecting is a moving warp in space-time itself. It’s kind of awesome to live in a time when we can (as a species) sense something so bizarre – and by doing so we’re spying on the most extreme kinds of physics, only found in conditions we could never reproduce here on Earth. Now LIGO has proved that there are gravitational wave sources out there, we’re faced with a new question: What kinds of extreme things could we sensing with them, as our detectors improve? The stellar beast that needs no introductions: Squeeze the core of a dying star hard enough and gravity becomes strong enough to override every other force. It shrinks the core down until the surface gravity is so intense that not even light could escape. Time essentially comes to a halt at the point of no return – called the event horizon – so, to an outside observer, every object that ever fell into the hole appears to be frozen on its edge. Both the gravitational wave signals detected so far by LIGO have (we think) been due to black holes spiralling around each other then colliding. Gravitational waves are produced by very heavy things moving very fast, so we hear a rising ‘chirp’ as the holes spiral quickly around each other, then collide and stop. All these exotic, supermassive, objects (see ‘Major Tom visits a magnetar) are heavy enough to produce the same kinds of gravitationl wave signatures black holes do as they collide, albeit less intensely. Supernova are huge stars, tens or hundreds of times bigger than the Sun, that explode. Although, ‘explode’ is underselling it: First the giant star runs out of fuel. Then the outer layers collapse inwards, crushing and heating the core. The collapsing layers superheat and explode, temporarily outshining an entire galaxy. In the core, at the moment of collapse, black holes, neutron stars, and other weird denizens of the interstellar zoo can be forged. All of this involves massive amounts of matter moving at very, very high speeds, which should produce a gravitational wave signature – especially if the explosion is lopsided. Some are thought to be, as some neutron stars are flying through space a high speed, like they were shot out of an insanely big cannon. In the centre of our galaxy – and, we suspect, most galaxies - lies a supermassive black hole weighing more than millions of Suns. When a star falls into one of these it accelerates to huge speeds just before it passes over the event horizon and into darkness – and huge masses moving at high speed equals gravitational waves. Neutron stars (and their close relatives magnetars) are both very dense, very heavy, and in many cases spin very very fast. They don’t produce gravitational waves as long as they spin on axis, but if something throws one off axis it would give a signal as it wobbled. And one of the things that could make a neutron star wobble is a ‘glitch’ or starquake in its mantle. Magnetars are prone to even more extreme events, driven by their magnetic fields, which are amongst the strongest in the universe. The beginning of the Universe, understandably, involved very high concentrations of matter and energy moving about very, very, fast. That will have left behind a sort of ‘noise’ (in sciencese it’s a ‘Stochastic’ source). These waves could have been amplified by interaction with the background curvature of space-time, amplifying tiny variations in it. That could tell us things about the distribution of matter and energy in the very early universe. Above: An artists impression of a solar system being dragged into a supermassive black hole.